The Best Philippines Youtube Channels from thousands of Philippines Youtube Channels in our index using search and social metrics. Subscribe to these youtubers because they are actively working to educate, inspire, and empower their audience with frequent updates and high-quality videos. About Youtuber CNN Philippines provides first-class news and information drawing on the strength and worldwide newsgathering power of CNN, and the local perspective and expertise of Nine Media Corporation. It offers Filipino viewers a global perspective on key issues and trending stories from around the world, together with in-depth local coverage. About Youtuber Hour Philippines TV is your essential guide to unforgettable food, travel and nightlife adventures in the Philippines and beyond. About Youtuber Philippine Primer will give you an overview on what’s new in the Philippines. We’re here to be your guide to the newly opened restaurants, in and out of the country travel destinations, and the most happening events. About Youtuber A Foreigner in the Philippines channel is about leading an adventurous life in the simplest way. About Youtuber Welcome to "PhillyinthePhilippines". My name is Brian and my wife's name is Luisa, the channel is about our adventure when we move to the Philippines. About Youtuber On the Amazing Philippines, you will get useful information and some videos about life in the Philippines. It is all about Renting, buying, shopping, scams and having fun. About Youtuber Riding Nomads in the Philippines channel offers different playlist, from Islands, Cities, to Vlogs and Road trips. And we show you the Philippines from different angles and through different eyes. About Youtuber My name is Wayne I am in the Philippines. The place I wanted to be and live to make a wonderful life here hopefully. I will post something useful to help others, as others have done for me, so come along follow me as I show you my life in the Philippines and future adventures as I encounter, as I explore the Philippines with this wonderful beautiful woman to me Vilma Nieva. About Youtuber Village People Philippines is a channel created by a group of Filipinos to present to the World, what is real everyday life for many Filipino people. About Youtuber The Philippine Experience will bring you the sights and sounds of the Philippines into your home. On this channel, we will try and keep you updated on the most current news and happenings in the Philippines as Sha and I travel the Archipelago. About Youtuber I am Sha living in the Philippines and my vlog is anything and everything about my province life. About Youtuber At My Philippine Journey, I share my experiences here in the Philippines. In my latest adventures, I take a motorcycle journey to major cities and key points in the Visayas. The islands I toured are Guimaras, Panay, Negros, Cebu, Mactan, Bohol, and Panglao. About Youtuber Welcome to the official YouTube channel of the Department of Foreign Affairs, Republic of the Philippines.It promotes and protects Philippine Interests in the Global Community. About Youtuber Coke Studio Philippines you will get to enjoy exclusive videos featuring our artists from their rehearsals and performances, to behind-the-scenes and Q&As, as well as song how-tos. It is a brand new music program that brings artists of different backgrounds and genres together to fuse their music into unique, new Pinoy sounds. About Youtuber Follow us to keep up with videos from DZMM. About Youtuber I am Joseph and in My Life In Metro Manila, you will find videos of my lifestyle. About Youtuber My name is RG Enriquez. I’m a cook and a purveyor of both traditionally vegan and veganized Filipino recipes. About Youtuber Smart Pinoy Investor gives Tip, tricks and free tutorials for beginners investing in Philippine Stock Market. About Youtuber Jack Northrup channel is dedicated to life and fun in the Philippines. Videos range from immigration information to and view on different cultural aspects of life here to our home craft projects and playing in the street. I love making the videos and do it in an entertaining manner when appropriate. About Youtuber I am Chris Wren and at A Brit in the Philippines, I will be posting videos that hopefully describe my Journey from Nottingham England to the Philippines and all the good and bad thing I encounter. About Youtuber Bride and Breakfast is a wedding resource committed to style, taste and beauty. We feature the most stylish, gorgeous and magazine-worthy weddings in the Metro, tapping the crème-de-la-crème of wedding suppliers (both seasoned and upcoming), and showcasing inspiring ideas that can help make your wedding fashionably chic and character-filled. About Youtuber At A Foreigner Farming in the Philippines you will get information about farming. About Youtuber A Foreigner's Wife in the Philippines will showcase ordinary life in the Philippines with views of Filipina -Foreigner relationship topics. About Youtuber At Air Rifle Hobbies Philippines you will get information about hunting, camping, hiking, and sports activities. About Youtuber Martha Sta. Barbara gives you aily beauty dose. About Youtuber Follow us to keep up with videos on the Philippines from Real Living Philippines. About Youtuber Spot.ph is your One-Stop Urban Lifestyle Guide to the Best of Manila. About Youtuber An American expat and his Filipina wife, living in the Philippines since 2013. We are "Discovering Samar - Before Others Do!" bringing you a straight forward and sometimes humorous perspective of everyday life.Living in the Pacific is about documenting and capturing the unspoiled natural beauty of the islands while enjoying life's most simple pleasures. About Youtuber The Philippines Survival is about life on the farm everyday living and taking care of life stoke. About Youtuber The Philippine Experience is about our life( My Filipina Wife,Daughter, and Myself ) in the Philippines and our everyday experiences here whether good or bad. I will be doing some reviews on resorts, pension houses, and restaurants. I hope that you all will join us on our adventures here in Argao, Cebu Philippines. About Youtuber Philo in the Philippines channel is about expat family life here in Metro Manila. About Youtuber PINOYFITNESS is a web-based community of athletes and fitness enthusiasts of different levels of experience and from all walks of life. About Youtuber Philippines Daily Life is about beauty style and fashion activities. About Youtuber PhilippineTatler takes you behind the scenes and reveals the fascinating lives and stories of influential people in business, culture, society, and sporting life of the Philippines. About Youtuber Hi, I am a Filipina living in the Philippines. On my channel I will feature and be able to immortalize Easy, Simple to-do Home Cooking ( that is either my personal recipes and/or Moms' and the rest of my family as we also share our love for food), Food and Restaurants (review, mukbang or eat-out), Travels and some interesting places, Journey and activities with family and friends. About Youtuber Nomadic Philippines Vlogs, we mainly focus on the Philippines but plan to travel to many other countries soon. Stay tuned in for more details. About Youtuber Our Philippine Life is a video diary of my retirement to the Philippine Islands, showing videos of our travels while exploring the Philippines from our home in Batangas, through Luzon Island, and eventually traveling to other islands, like Mindoro, Cebu, Bohol, Boracay, Negros, Palawan, and Mindanao. About Youtuber Live in the Philippines is a community of many thousands of people who share their experiences and enjoy reading about the experiences of others. About Youtuber Parutangel is about Food at Restaurants, Cafes, and Street Food in the Philippines mainly. About Youtuber Follow us to keep up with videos from DashCam Diaries Philippines. About Youtuber Follow us to know more on the Philippines from Island Hopping in the Philippines. About Youtuber Travel with Dheiy is about traveling around the Philippine and my first step travel is in Mindanao, and I aim to bring you to a place where paradise still exists here in the Philippines. About Youtuber Steve In The Philippines is about videos while in the Philippines and my some thoughts and ramblings. About Youtuber Experience Philippines Studios is a video library of all the different activities, road trips, hangouts, experiences organized by the first EXPERIENCE company in the country. We are proud to be the first EXPERIENCE platform and marketplace for unique and exciting things to do, to try in the Philippines. About Youtuber Farm In the Philippines in all about farming and building a house in Negros island in the Philippines. About Youtuber 8List.ph is a groundbreaking and award-winning digital publication that appeals to a new generation of Filipinos. It is your daily dose of entertaining lists. About Youtuber Hello I'm Hannah from the Philippines and Hannah from the Philippines explores the beauty of the Philippines! About Youtuber M. Louise shares happy family moments and beautiful places in the Philippines with the world. About Youtuber Philippines Darrell Cheeks is about the experience in the Philippines. 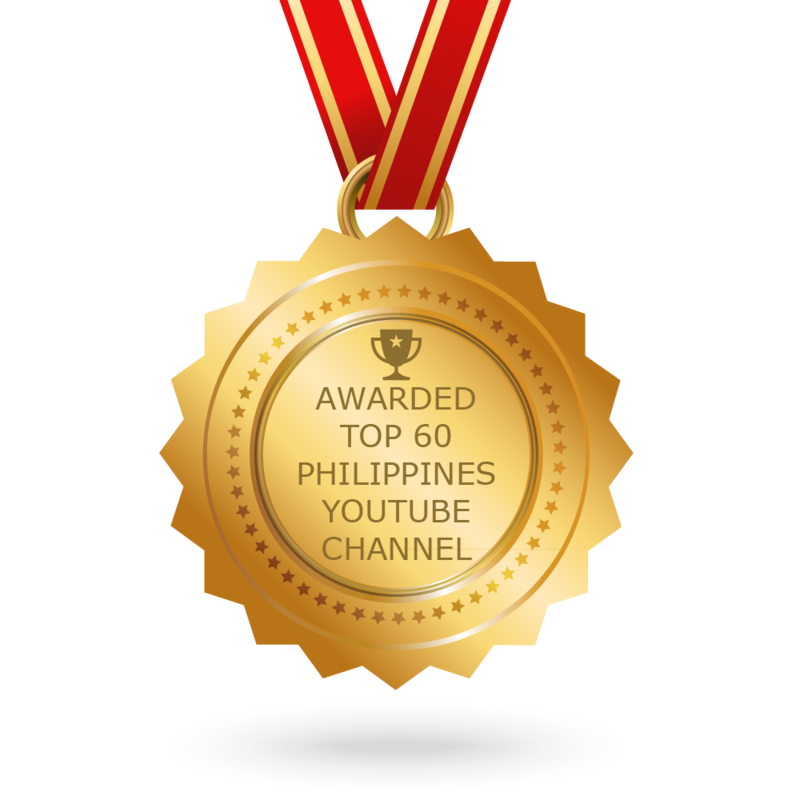 CONGRATULATIONS to every youtuber that has made this Top Philippines Youtube Channels list! This is the most comprehensive list of best Philippines Youtube Channels on the internet and I’m honoured to have you as part of this! I personally give you a high-five and want to thank you for your contribution to this world.